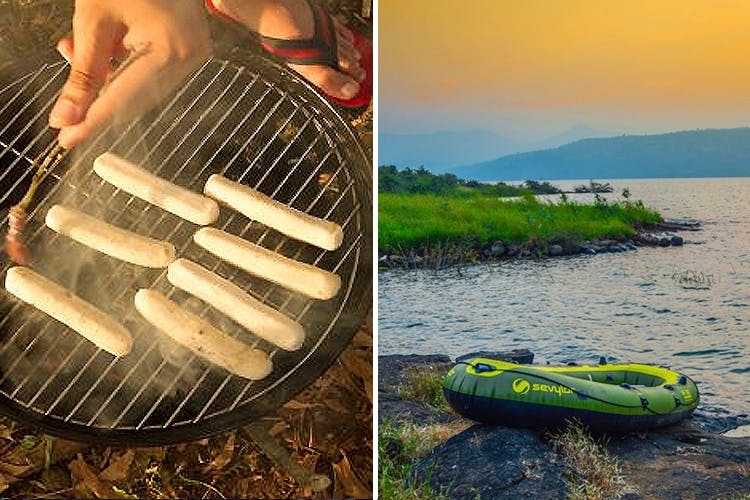 Camp under the starry sky amidst thousands of fireflies at the Rajmachi peak, 18km from Lonavala, nestled in the rugged hills of the Sahyadri ranges, for INR 2,500. A three-hour drive from Pune, Rajmachi peak is abode to two historical forts – Shrivardhan and Manaranjan with the vast Machi plateau surrounding both the forts. There is a small village, Udhewadi, situated at the southern foot of the Manaranjan Killa. Trekkers and tourists can visit the village for some authentic Maharastrian delicacies cooked by the locals. Monsoons are the best time to camp at Rajmachi. With a beautiful lake by your tent, swarms of fireflies right above your head, abundance of thick green foliage and magnificent waterfalls, Rajmachi campsite is no less than heaven itself! In the morning, go on a hiking trail in the surrounding areas. The area is lined with blackberry shrubs, elegant wild flowers and century-old tall strong trees. But it is advisable to come back to the campsite post dusk. Watch the serene sunset with a bottle of chilled beer in your hand. That’s bliss, isn’t it? The temperature at Rajmachi dips to 12-15 degrees in the evenings. So, don’t forget to carry a blanket and a jacket. What more? You can barbecue at the campsite with your buds. If you’re in for some adventure, you can also go for a short night trek after dinner. But make sure, you’re either accompanied by a professional or a localite. Letscampout arranges for monsoon treks and camps at Rajmachi for INR 2,500. The team provides for weather-proof tents with comfortable foam mattresses, so that you can get a good night’s sleep even at a campsite. Meals include barbecues, dinner, breakfast and snacks with tea and coffee. Connect with them at letscampout.com or just give them a call on +91-9819813493.